Protect your floors with a new look with our specialty coatings products. From VCT tile, linoleum, ceramic, concrete, stone or even specialty stainless steel equipment we can apply a coating to improve their look, increase their life or effective usefulness, and protect them from man made or microbial attack. Surfaces range from a high gloss, to a matte, as well as none reflective or glossy. COATINGS are revolutionary solvent or water-based coating that will truly make your floors look like new. Not only does our VCT or linoleum floor finish transform the look of your floors, it is easier to maintain than conventional acrylic wax finishes, with exceptional durability. The finish can last for years before any need for burnishing or stripping. 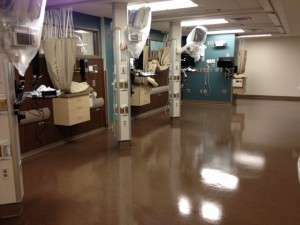 With its high slip resistance and zero VOC content, our coating provided are the ideal high-gloss finish for floors in facilities where safety is a concern, such as restaurants, medical and healthcare facilities, and childcare centers. Unlike conventional acrylic wax finishes, they are proven to inhibit the growth of bacteria and mold, offering an added level of protection. Lower your maintenance costs and transform the look of your floors with one of our many coatings available.